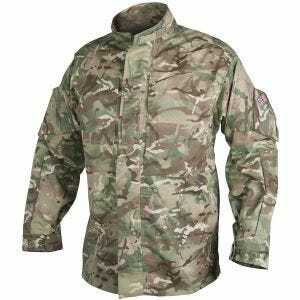 Helikon Personal Clothing System uniform consists of combat shirt and cargo trousers, both in distinctive MP camo resembling British forces Multi-Terrain Pattern. PCS shirt features a Mandarin collar and zippered front with a storm flap, two generous chest pockets with vertical openings, upper and lower arm pockets, cuffs with large buttons and chest epaulette for a unit or rank slide. 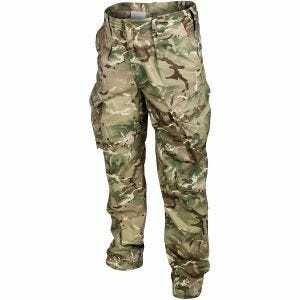 Matching PCS trousers come with a zip fly, two hand pockets, two angled cargo pockets and a single rear pocket with button fastening and flap, as well as drawstring legs and wide belt loops. PCS shirt and combat trousers are available now at Military 1st online store together with the matching field cap, bonnie hat and camouflage parka. Moreover, Helikon's MP camo works great across a wide range of environments including desert, woodland, mountains and urban surroundings.